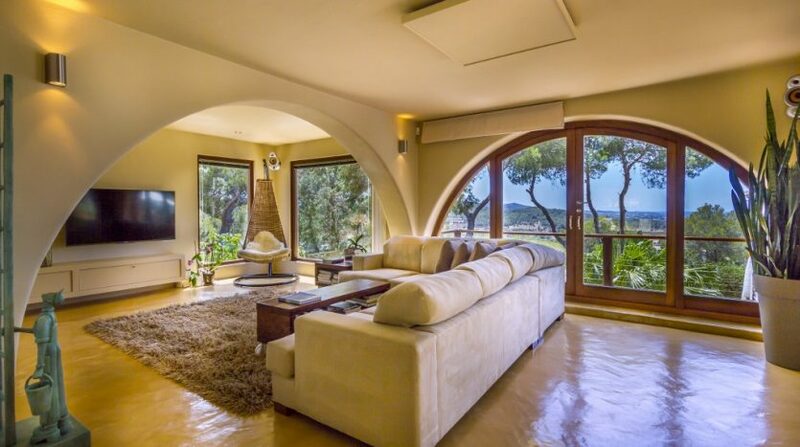 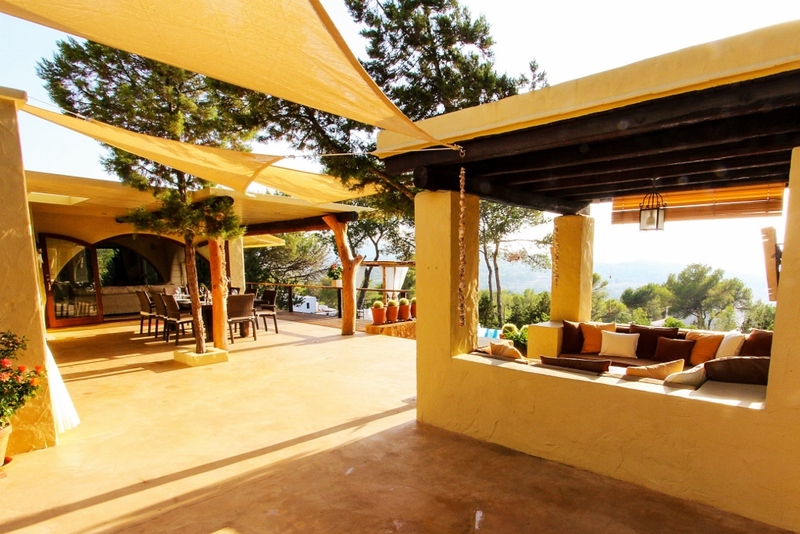 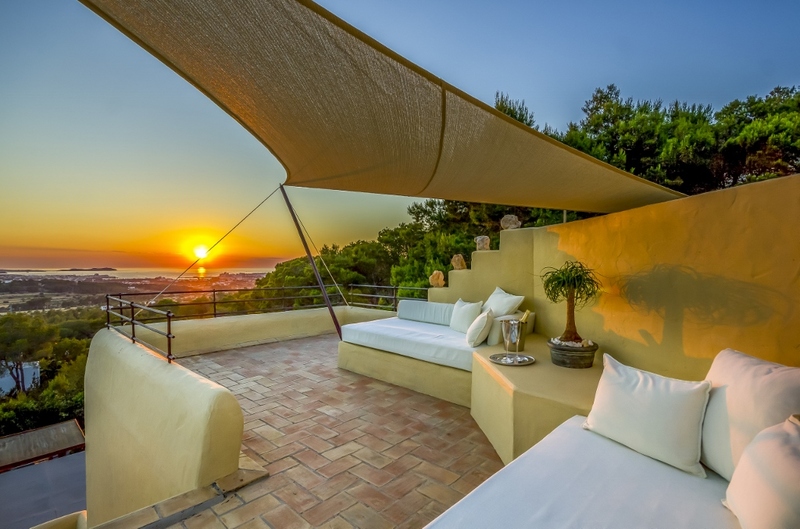 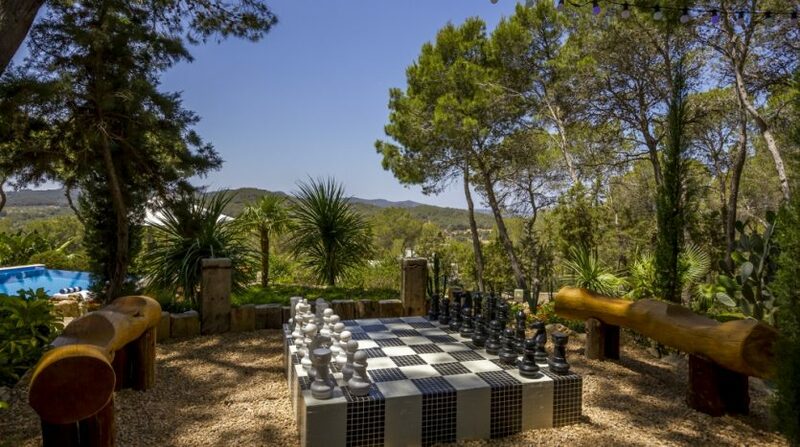 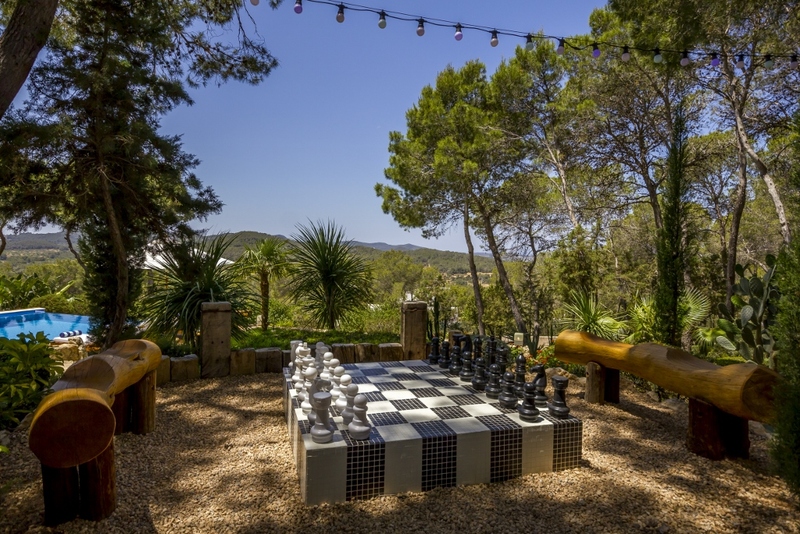 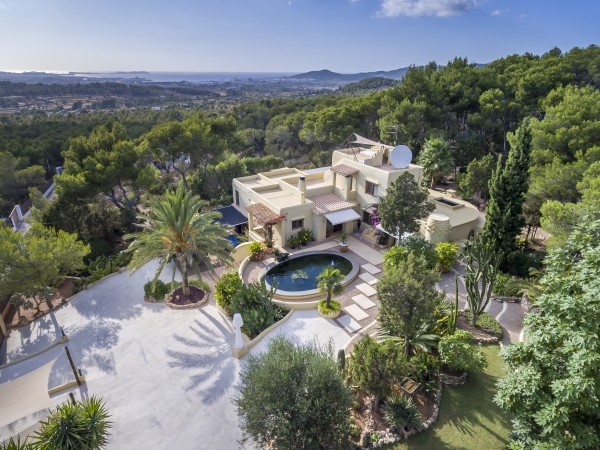 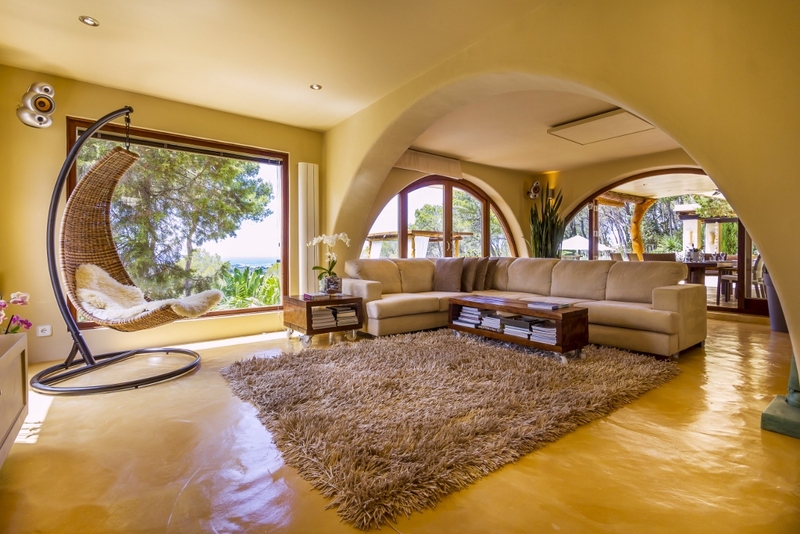 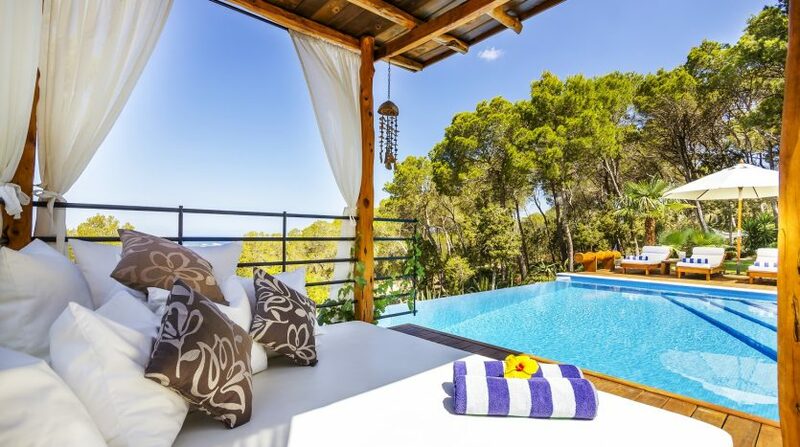 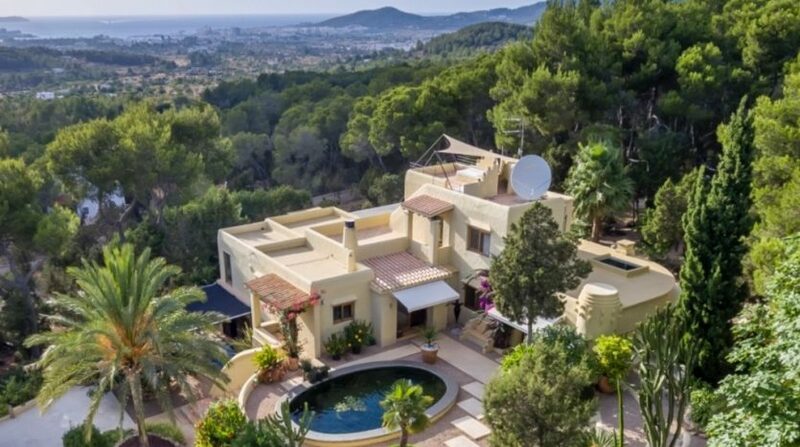 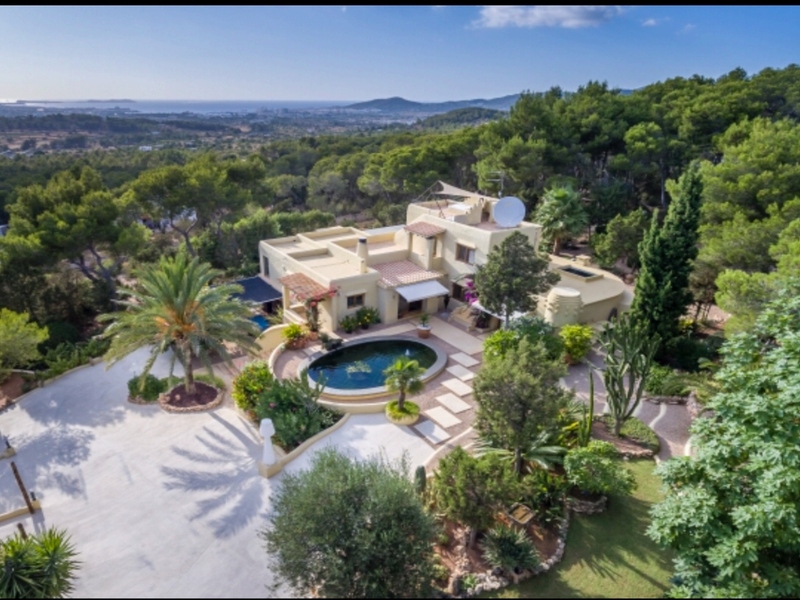 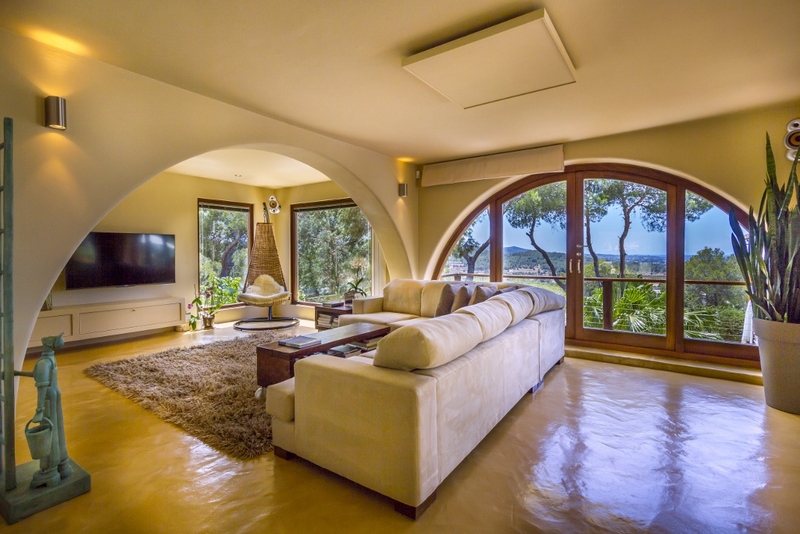 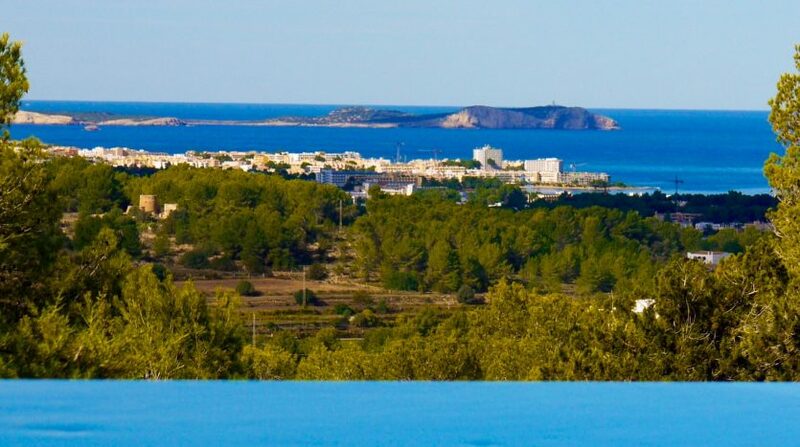 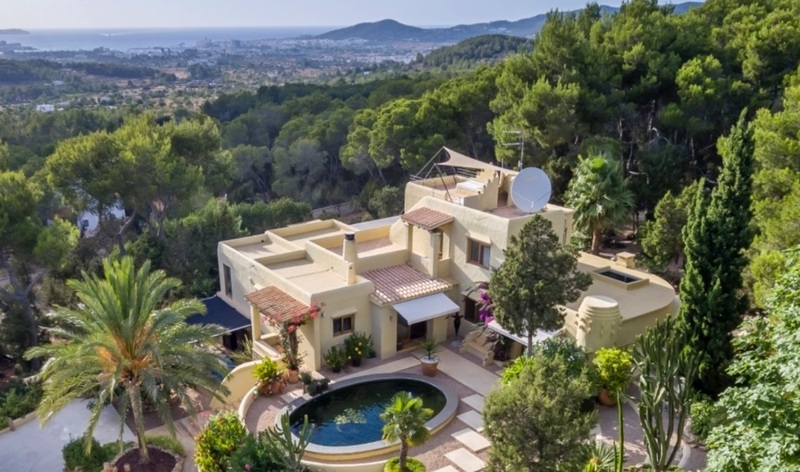 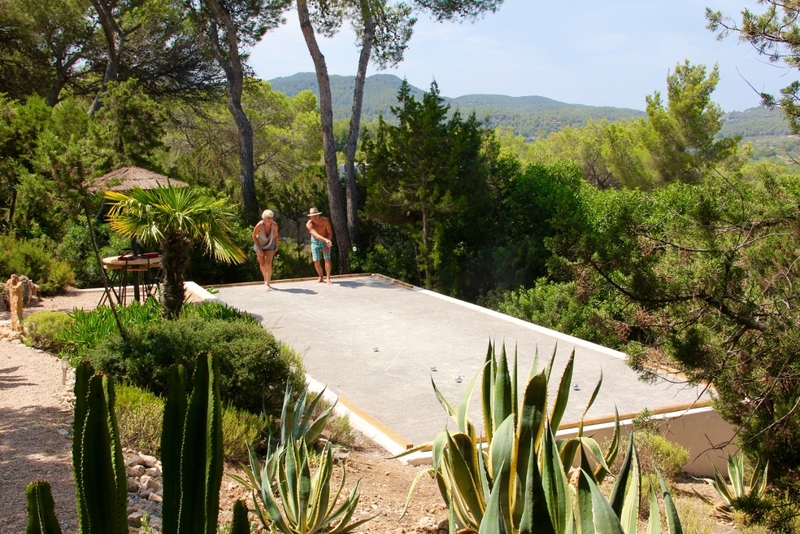 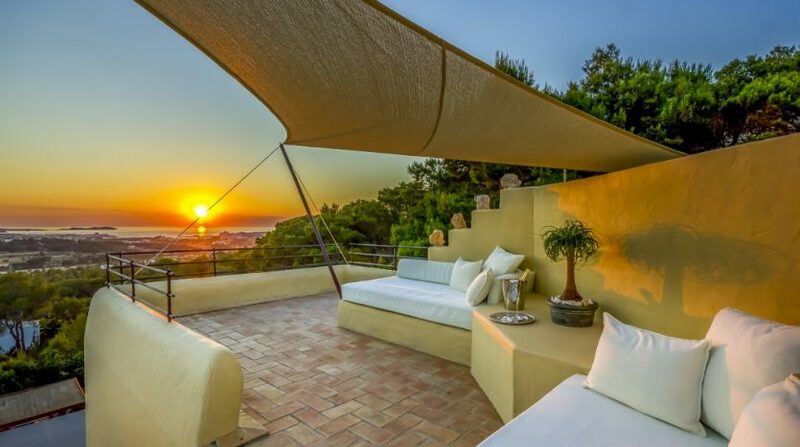 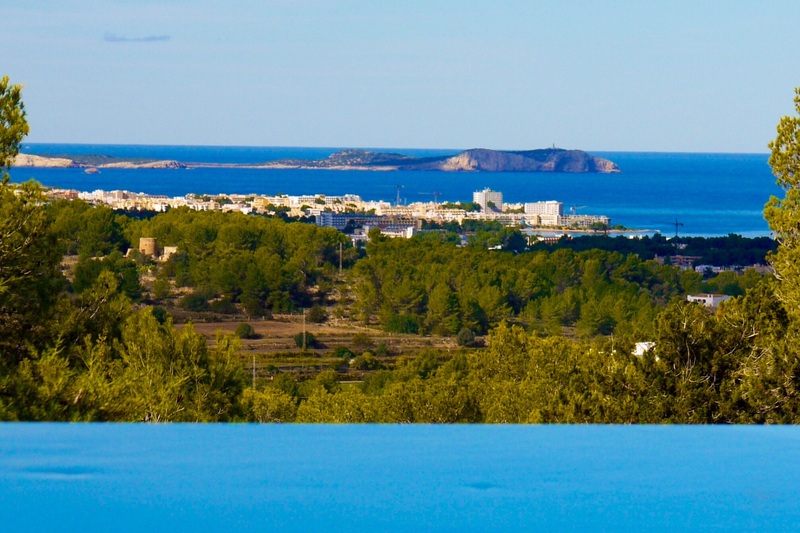 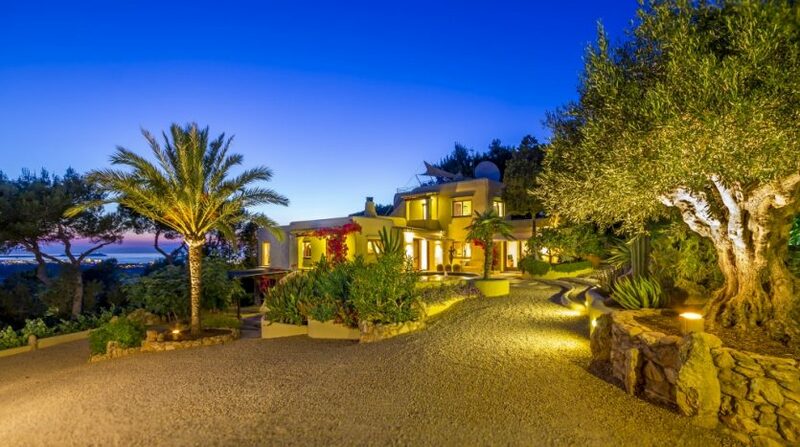 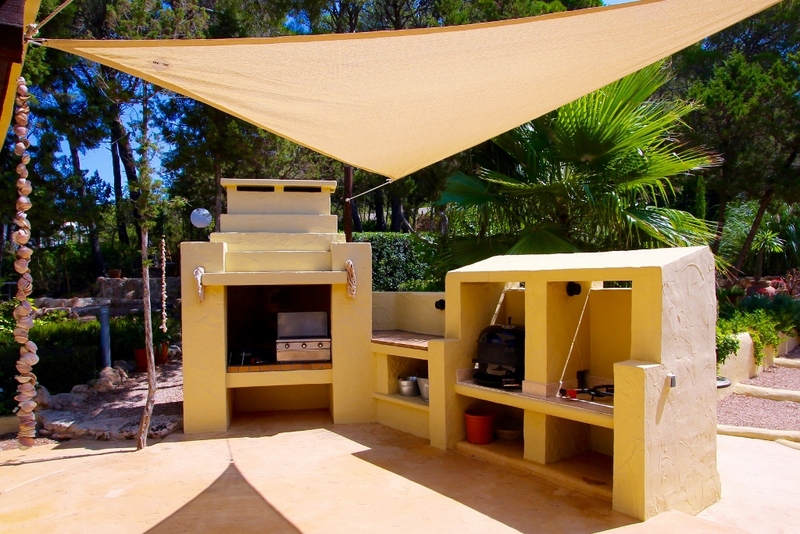 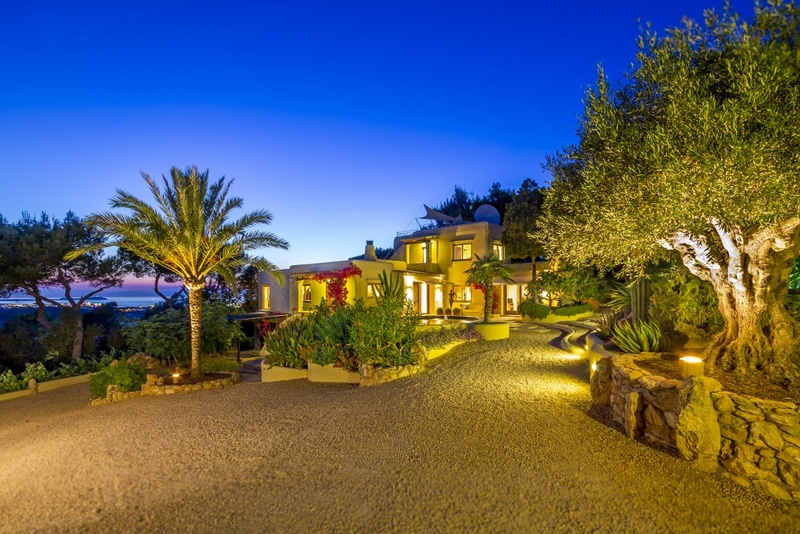 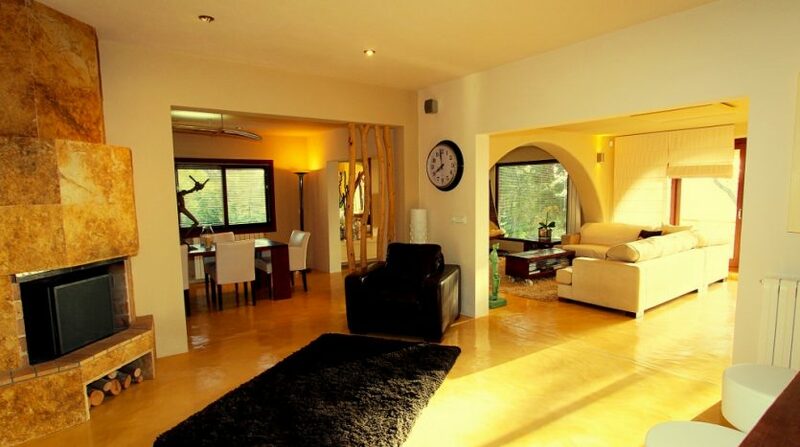 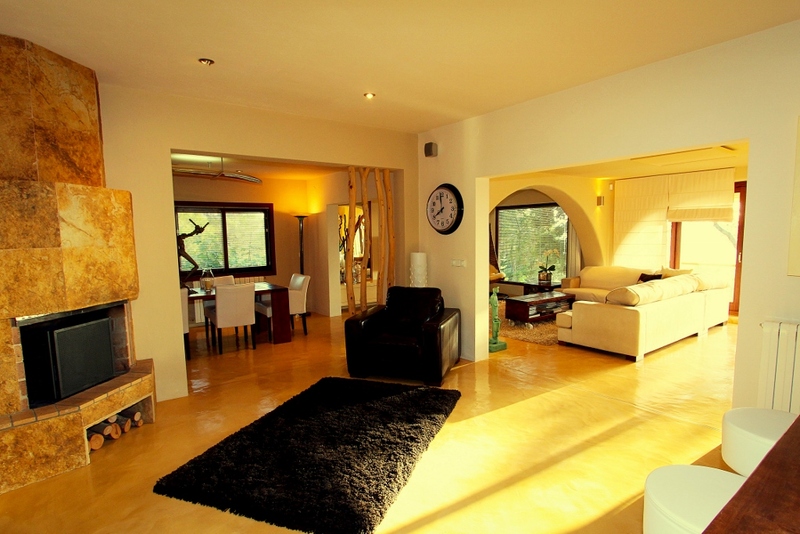 Stunning Ibiza villa located within a pine forest and enjoying panoramic sea views. 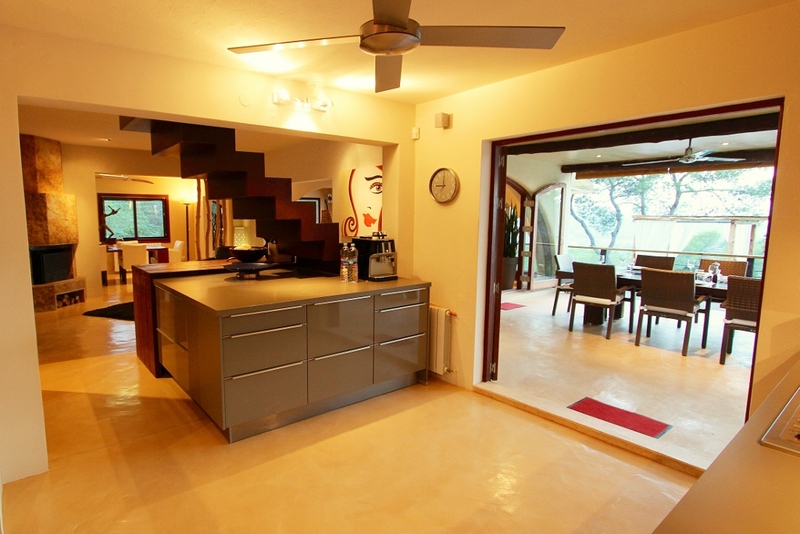 Spacious accommodation, contemporary styling and fantastic outside space. 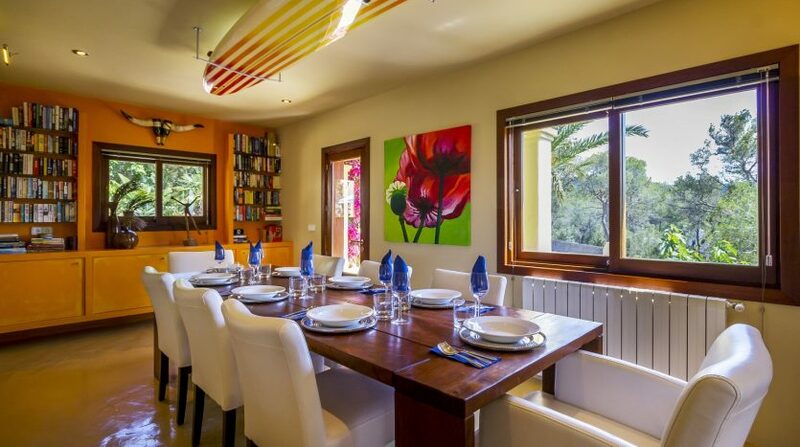 Set within 8,000M2 of land, the villa is the ideal retreat from stress and can also be used for rentals (tourism licence in place). 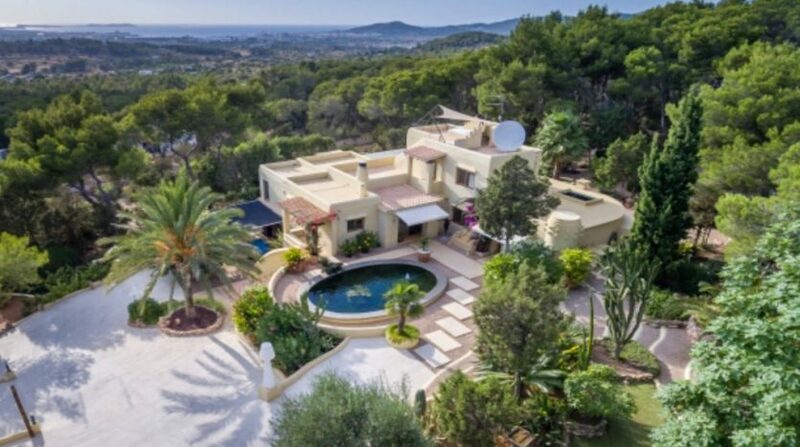 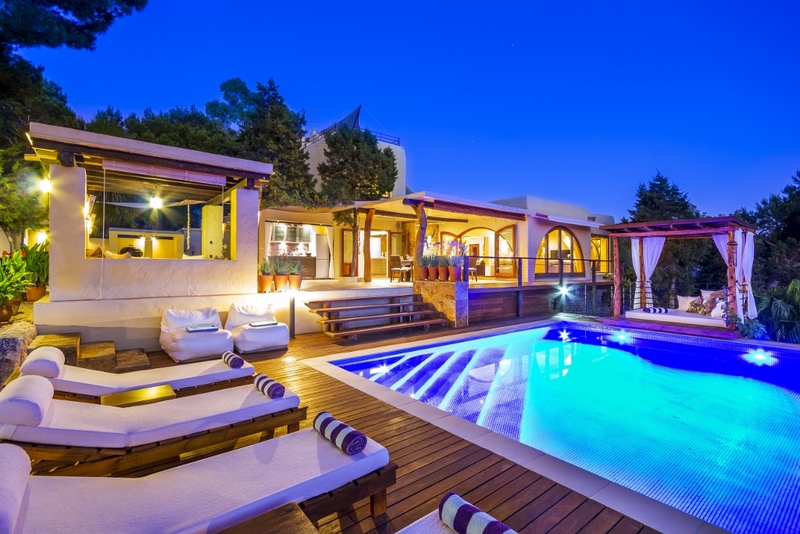 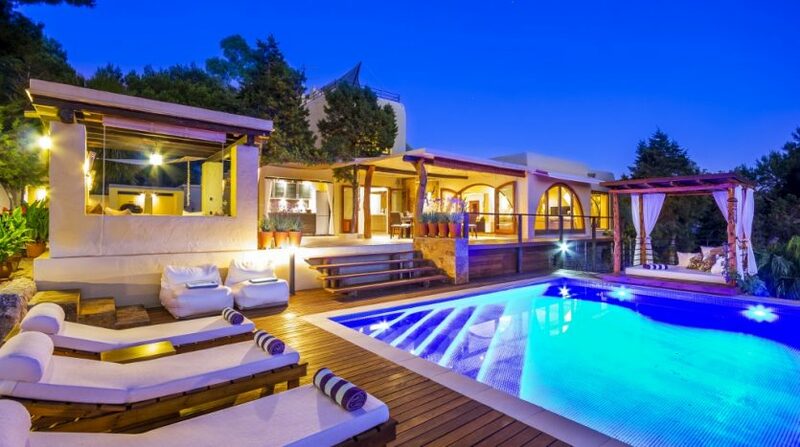 This stunning Ibiza villa is built in the typical Mediterranean style with flat roofs and an emphasis on enjoying the outside space. 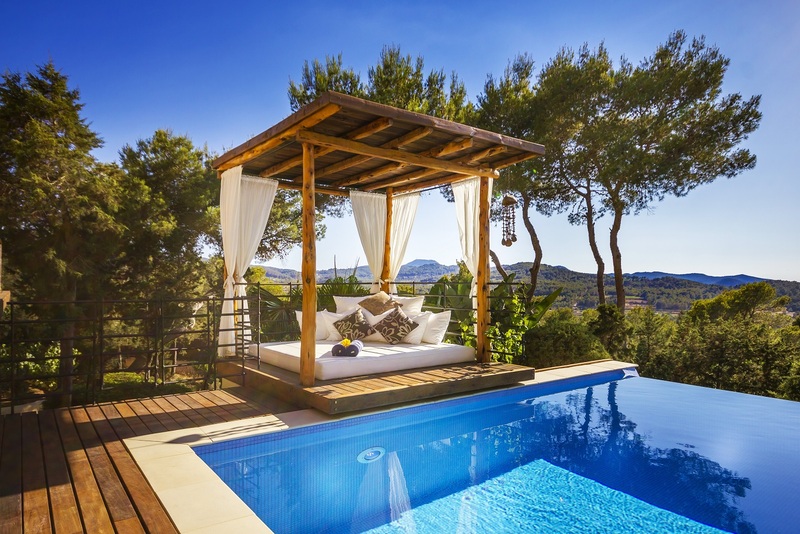 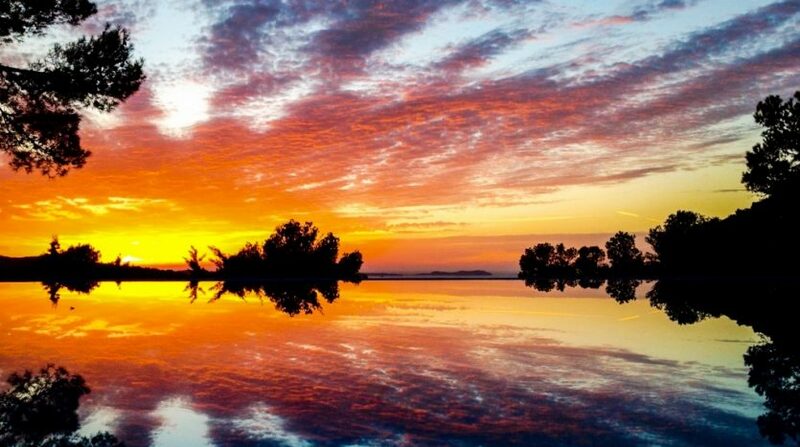 The location is peaceful but not isolated, this would make the perfect year-round home or an exclusive holiday home which can be rented when not in use. 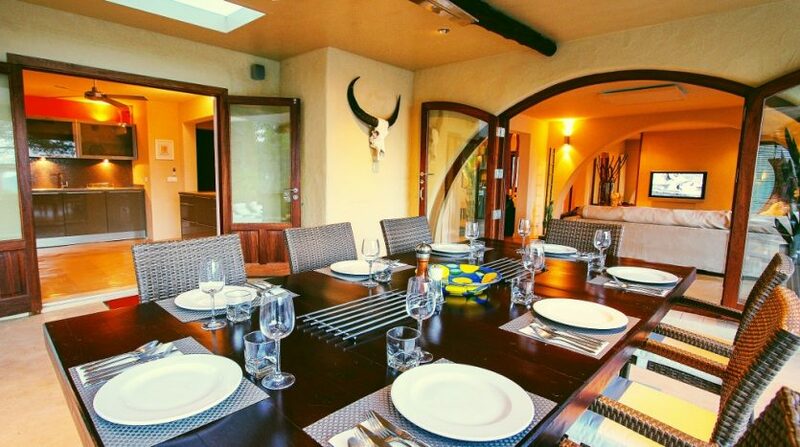 The property has been renovated and adapted to offer stylish and spacious accommodation and it could easily accommodate more bedrooms if wanted. 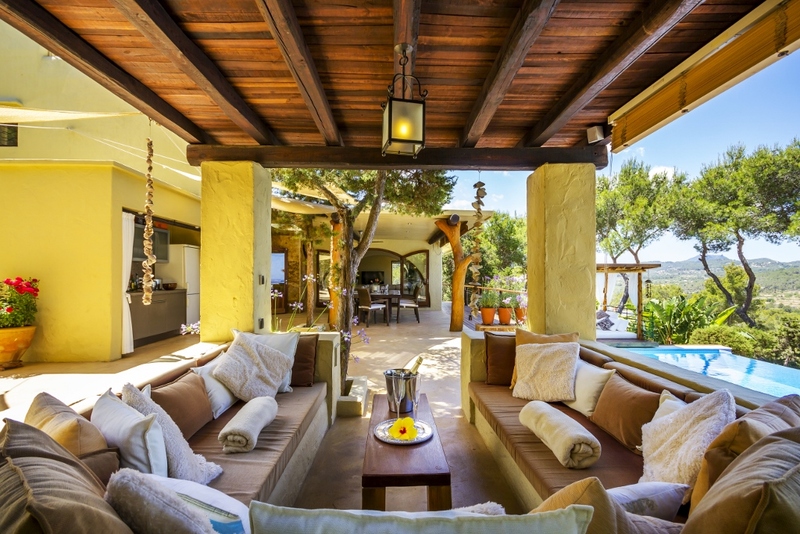 The current owners wanted large rooms with a flow that connects perfectly with the outside space and gardens. 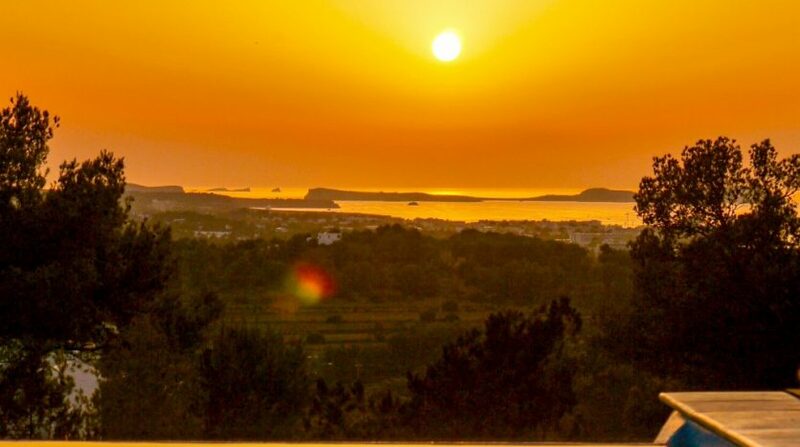 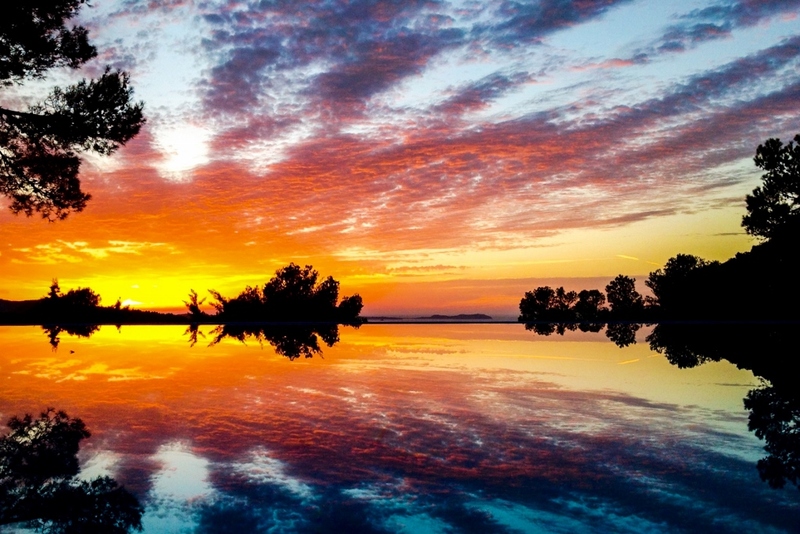 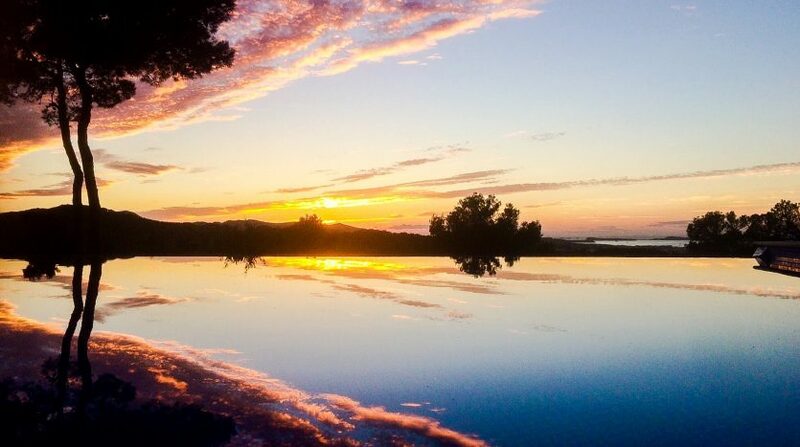 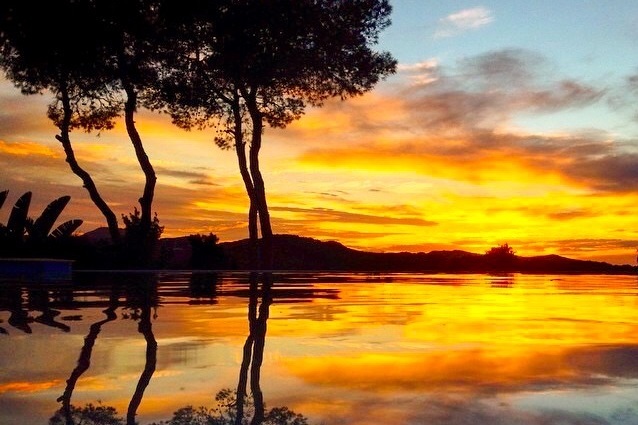 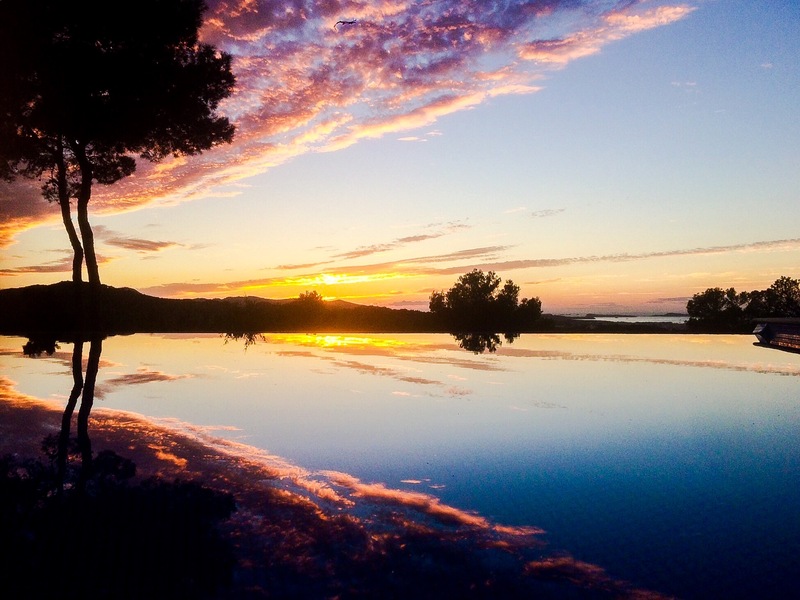 The views are stunning – to the sea, the surrounding countryside and you are in the perfect spot to enjoy the famous Ibiza sunsets. 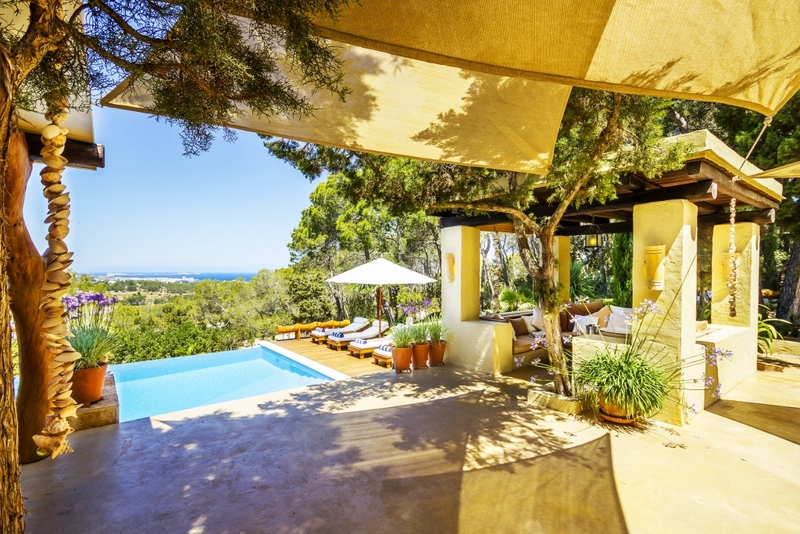 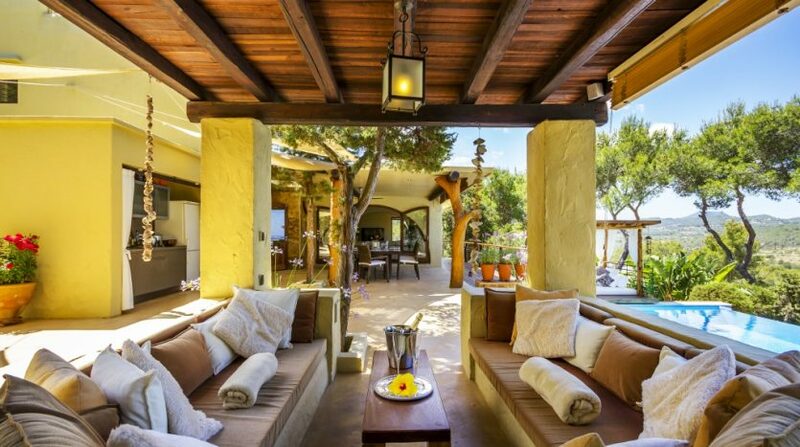 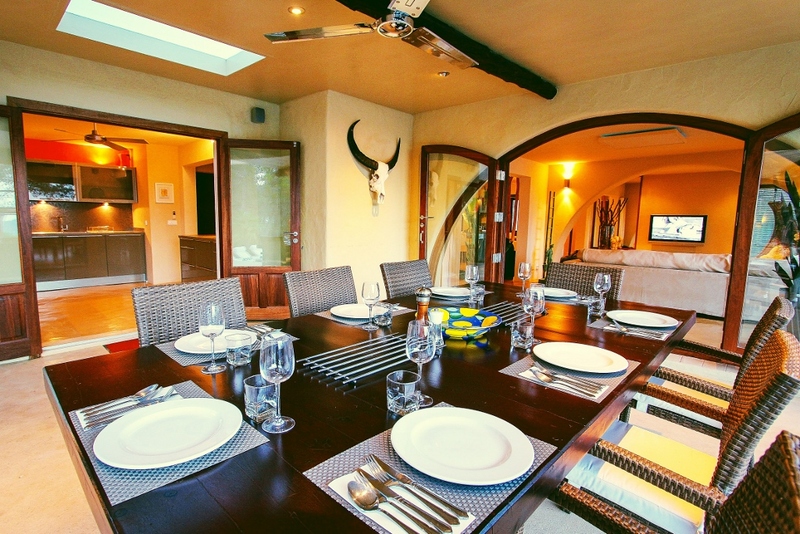 The villa is built in the Mediterranean style with the main living accommodation flowing effortlessly from the living room and open plan kitchen to the covered dining table on the main terrace which has a cushioned chill-out cabana, barbeque/paella summer kitchen and outside bar. 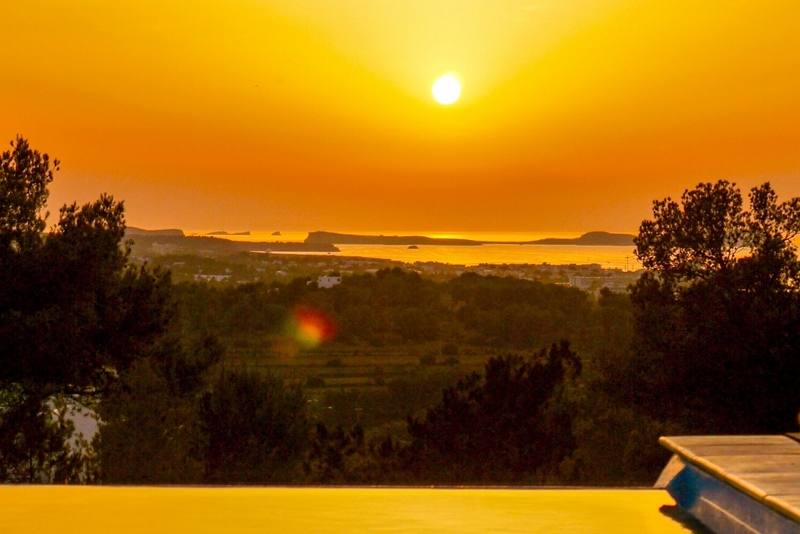 There are two roof terraces, the top level has a shaded awning with spectacular 360 degree views of the sea and countryside – perfect for sunset cocktails. 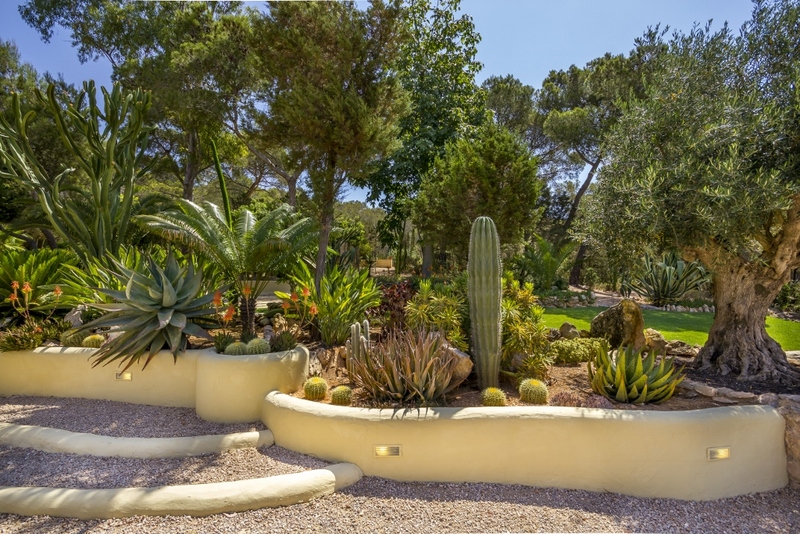 There are terraced beds with plants from around the world and two lawn areas. 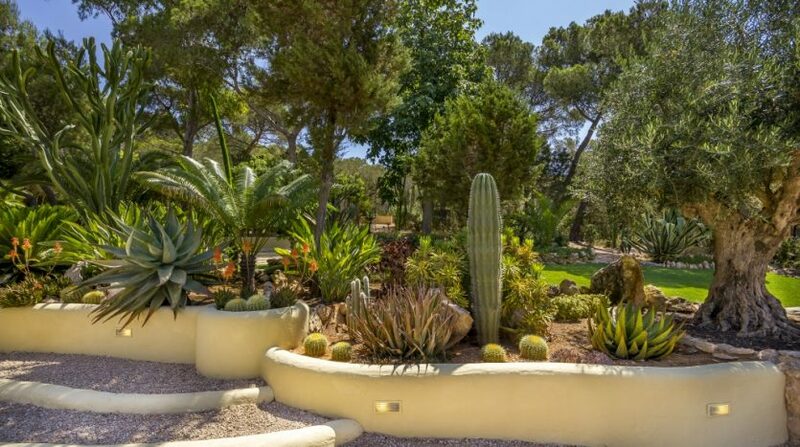 Paths lead through the pines and cacti to hammocks and a shaded dining area set amongst the trees, seating eight people. 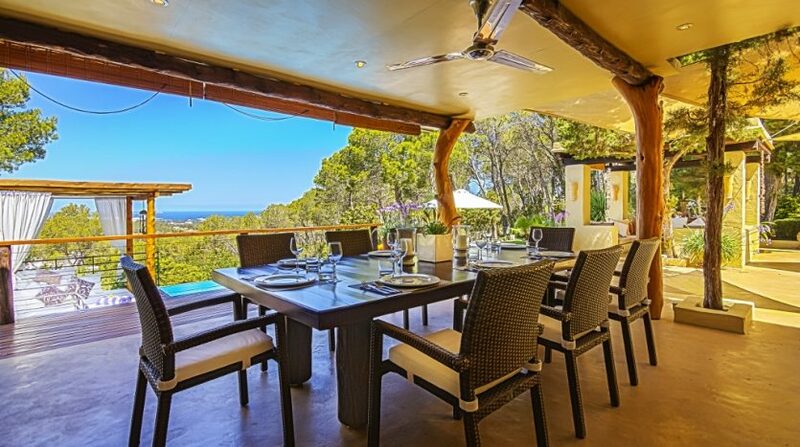 The villa has a truly luxurious appeal with the kitchen creating the heart of the home – it has a wide breakfast bar, two ovens, five ring gas hob and a large American style fridge and separate freezer, dishwasher and washing machine. 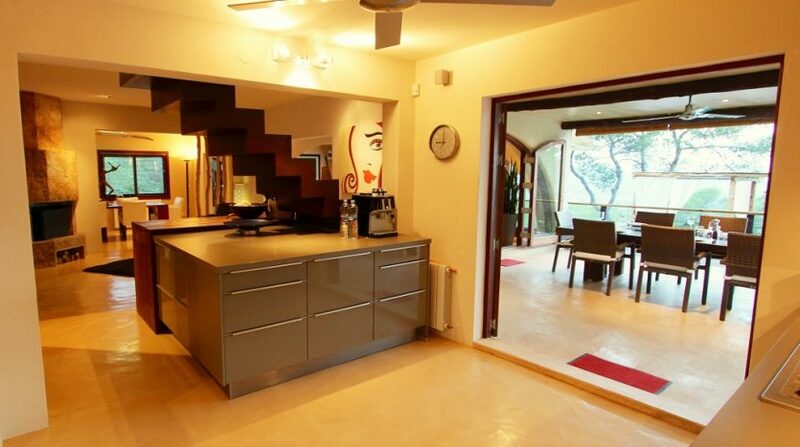 The kitchen is very well equipped as the owners spend the winter here so this isn’t just a rental kitchen. 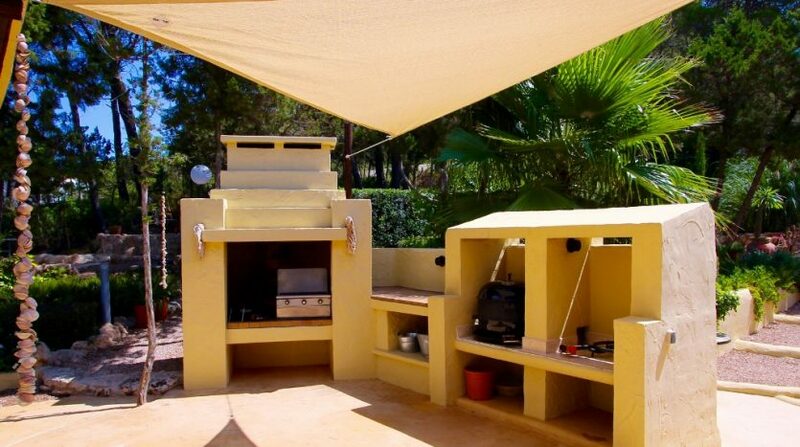 The bar on the terrace has a sink, dishwasher and a fridge/freezer for drinks and ice. 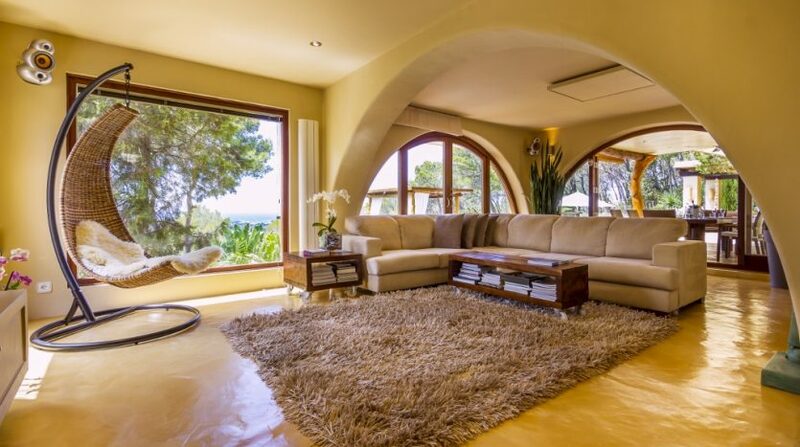 The sitting room has a comfortable corner sofa and TV with doors leading to the terrace and a huge picture window to make the most of the views. 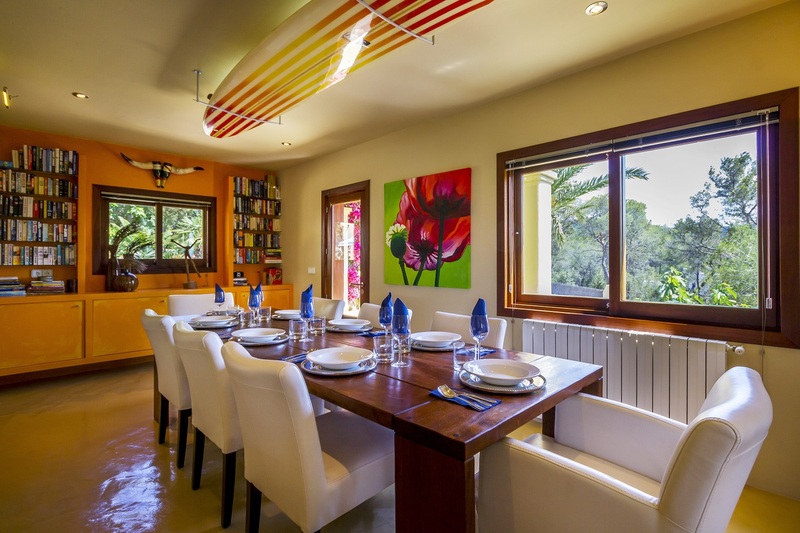 The inside dining room seats eight. 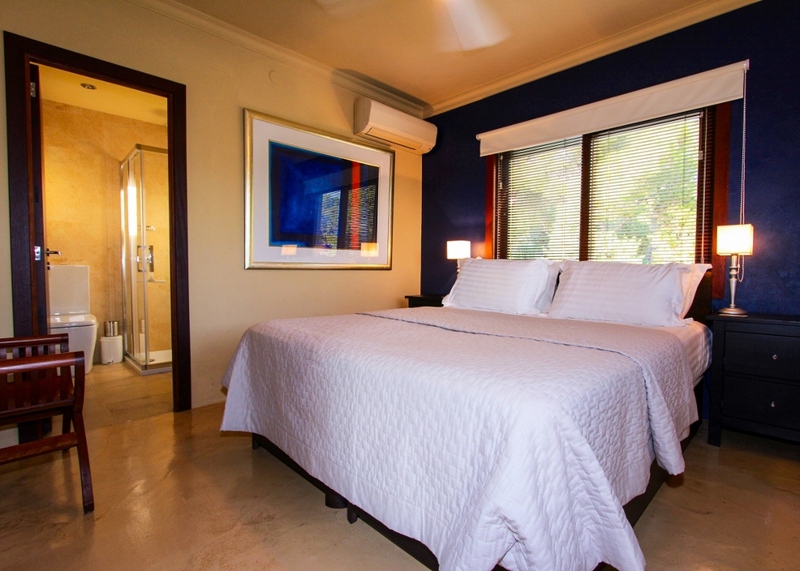 The stunning master bedroom is on the ground floor and has a walk through dressing room and accommodates an extra king size bed. 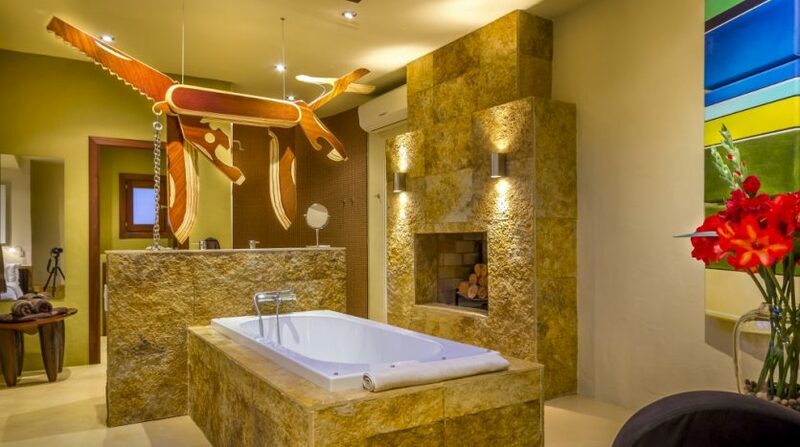 This room is huge and with a bath in the bedroom and an open shower/wet room with his and her basins, the boutique hotel feel really kicks in. 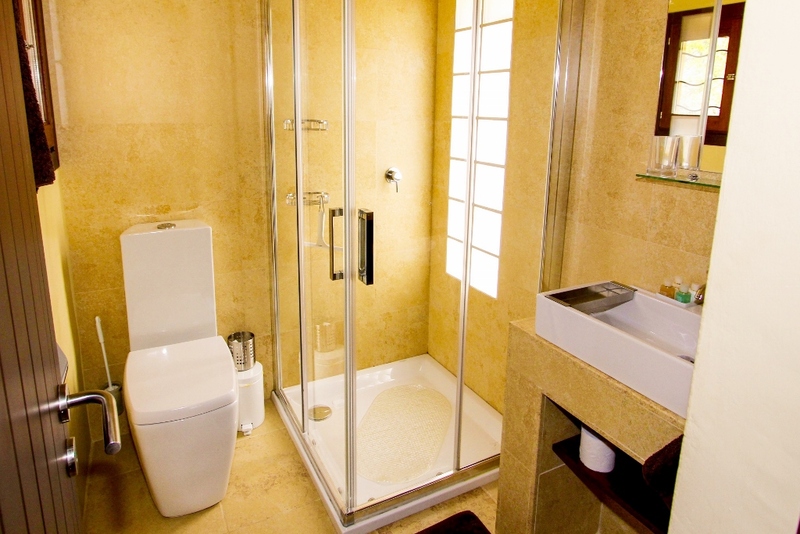 There is also a separate toilet with bidet. 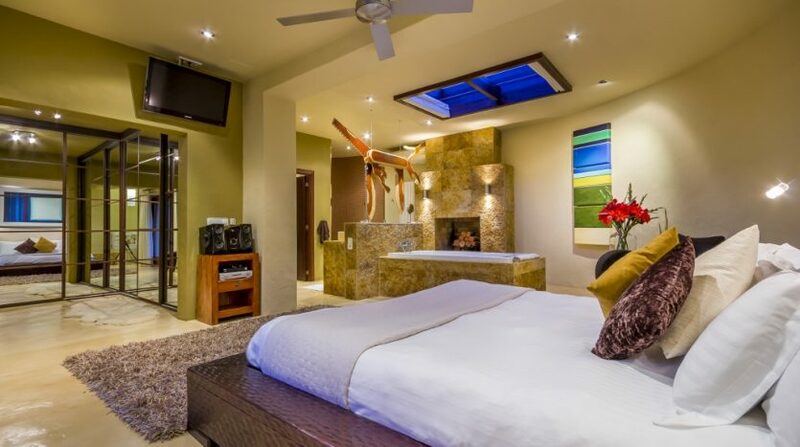 Sliding doors connect the master bedroom to the garden and koi pond. 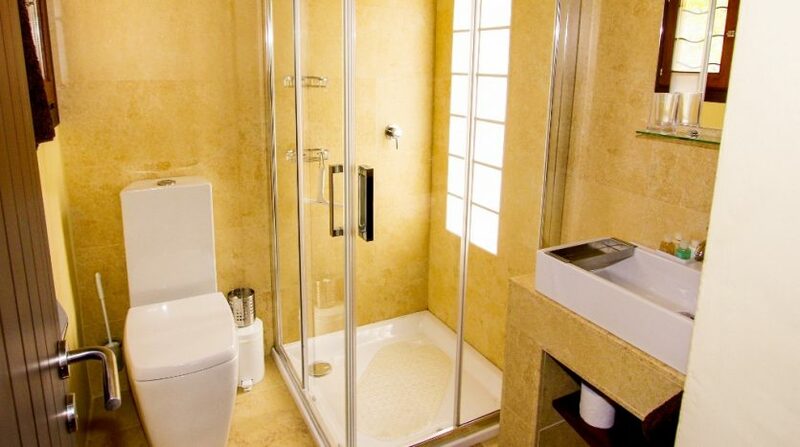 Upstairs there are two bedrooms each with an en-suite shower room and access to the roof terraces. 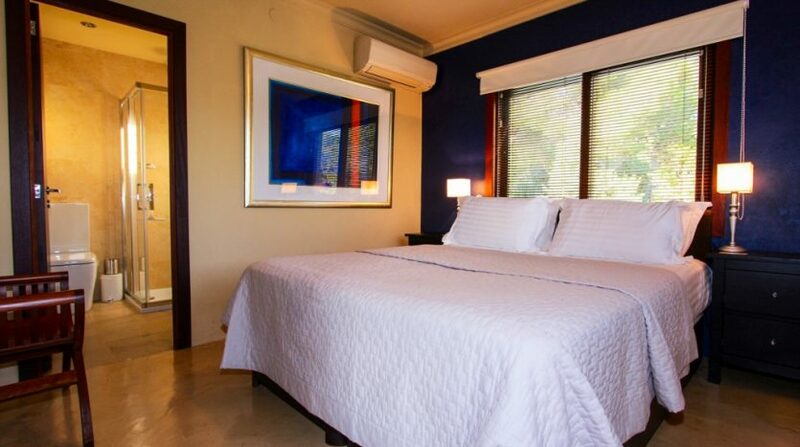 Both of these bedrooms have air-conditioning and ceiling fans. 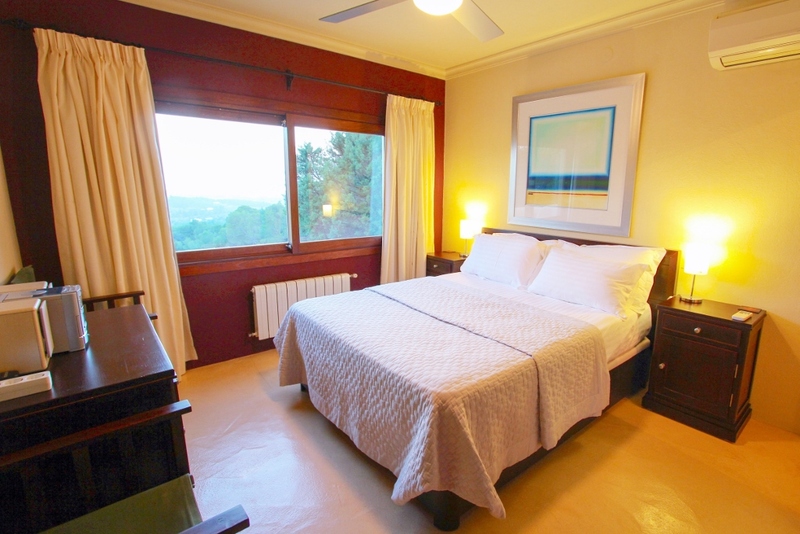 The front bedroom has spectacular sea and sunset views whilst the other bedroom has fabulous double aspect views of the garden. 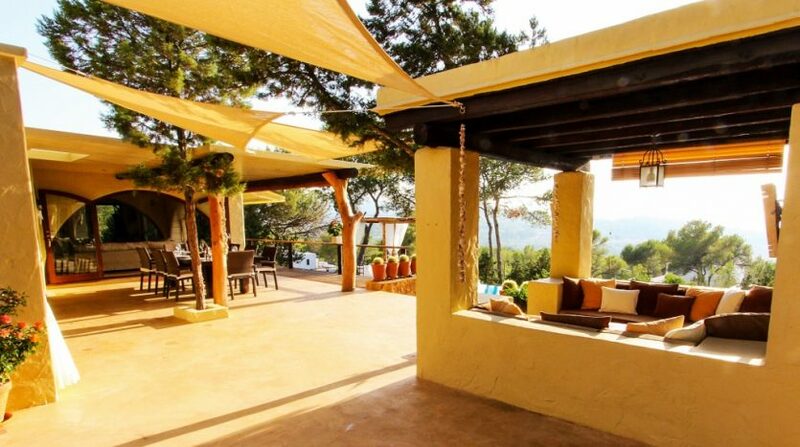 The property really does have very special outside space including various terrace areas to enjoy at different times of day. 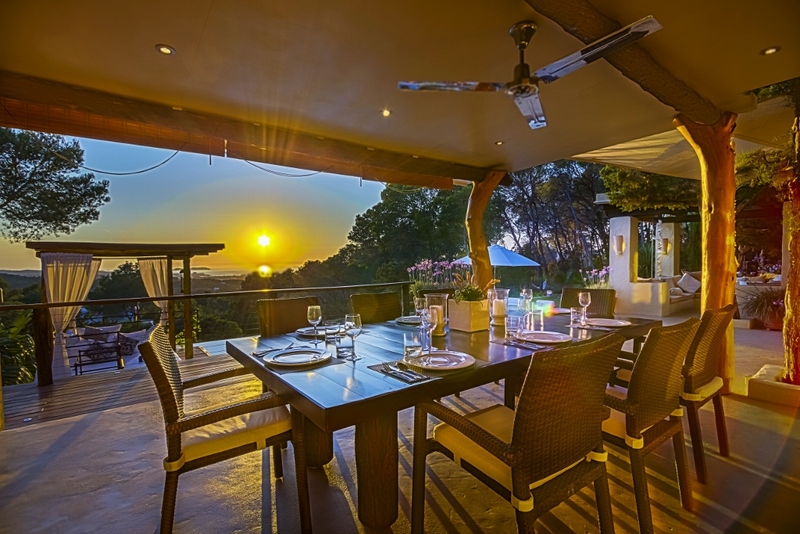 Outside kitchen, covered terraces, roof terraces with great sea views, sunken seating areas, outside dining area – the options are endless and make this a home all year round. 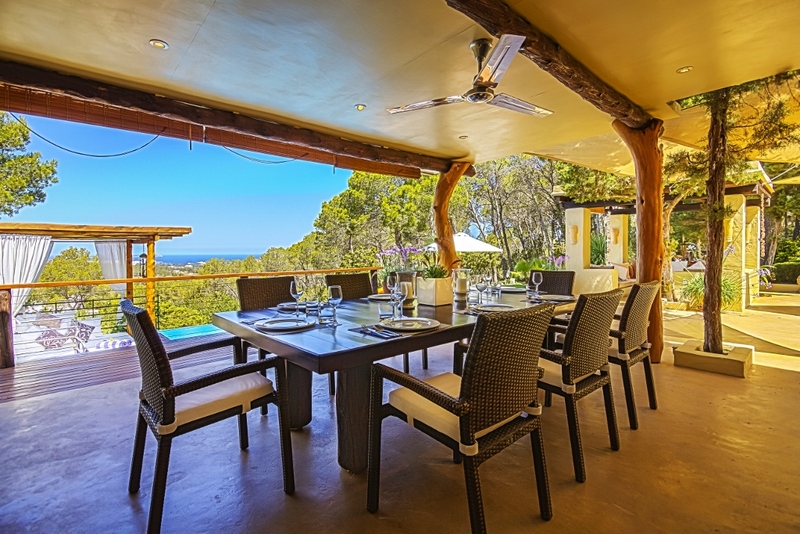 The gardens are mature with well stocked gardens and planters – the land area totals 8,000m2 (2 acres) and this is fully enclosed with remote controlled entrance gates. 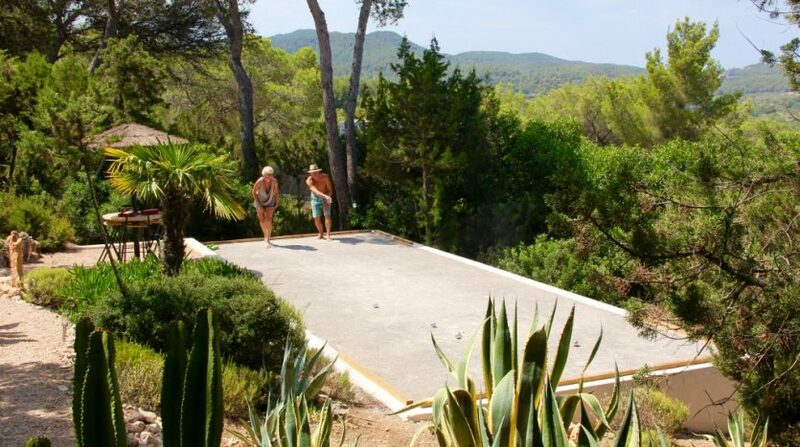 There is an olive, fig, lemon and lime tree on the plot. 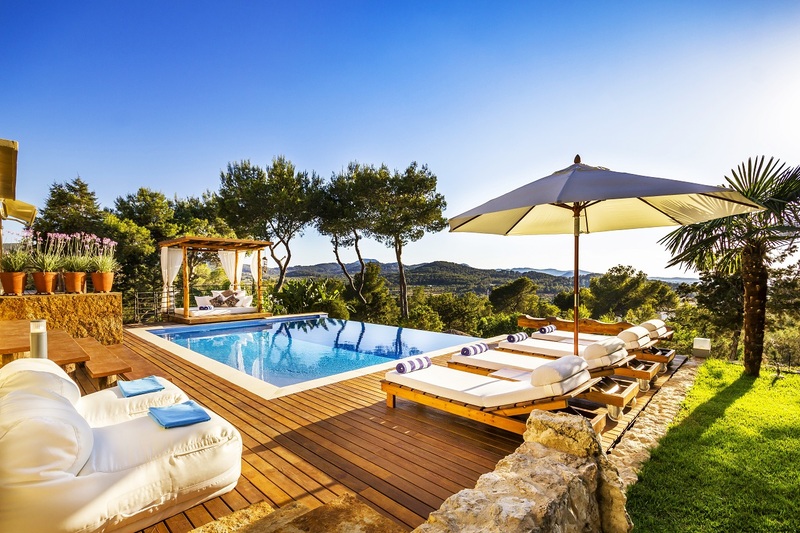 The main terrace leads to a solar heated infinity pool, surrounded by a wooden sundeck with sun loungers and a king size day bed and then on to the lawn and gardens. 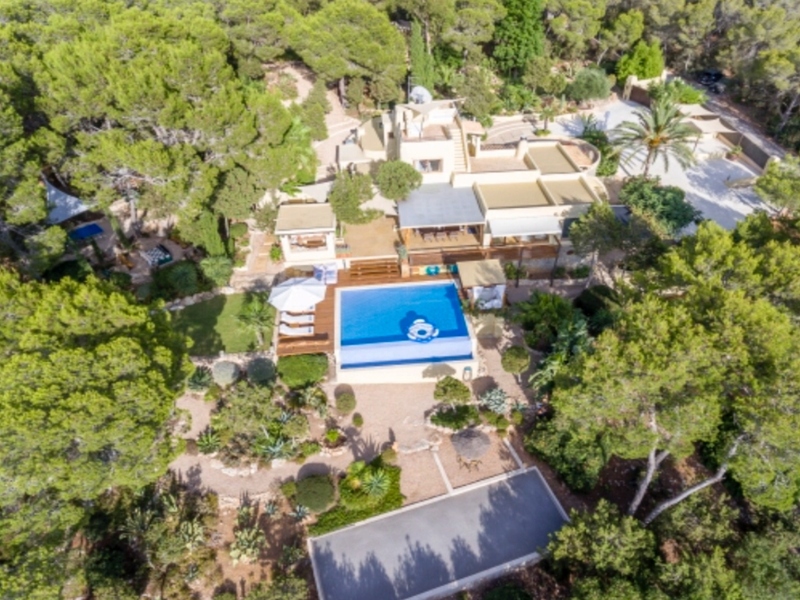 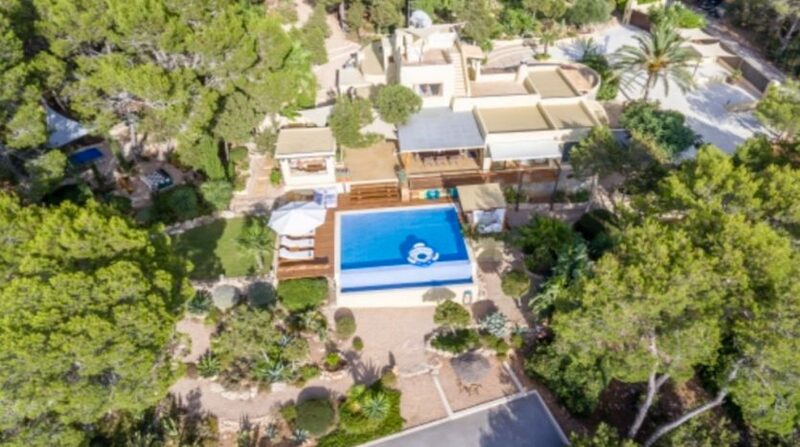 The location is the ideal mix of peaceful and private location but is just 2kms from the main Ibiza to St Antonio road making the entire island easily accessible. 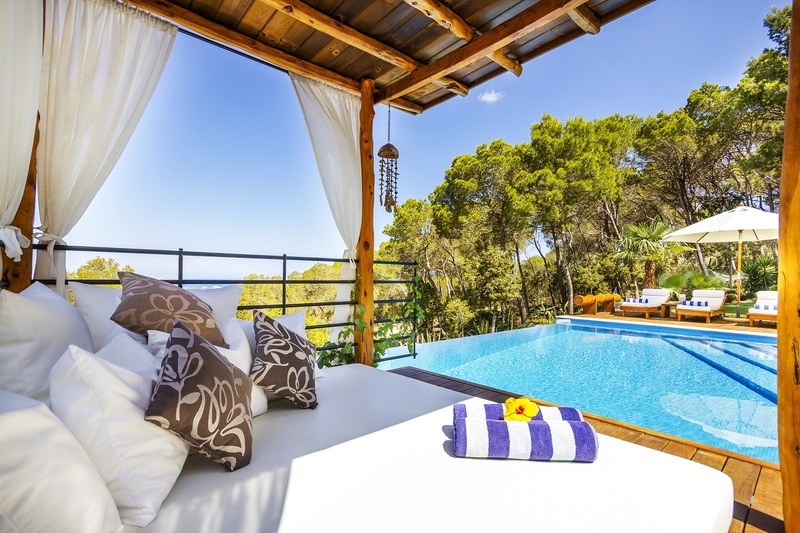 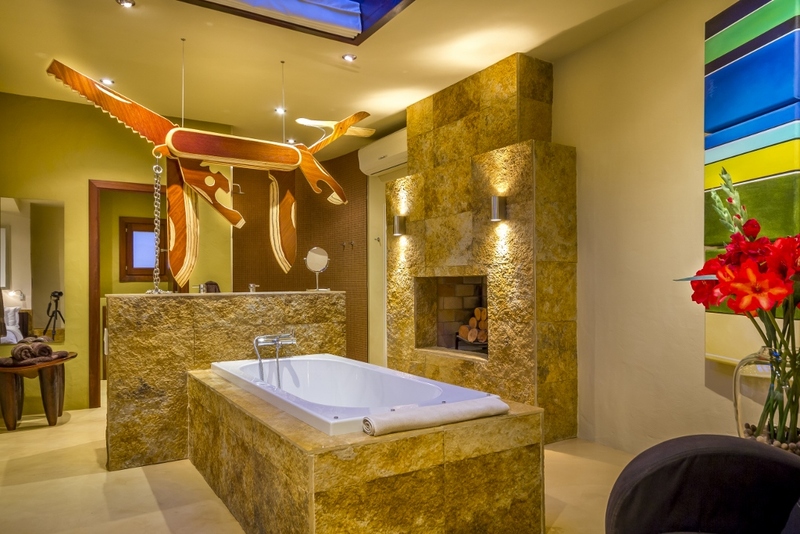 The villa is surrounded by pine forested hillside and this itself protects the local environment. 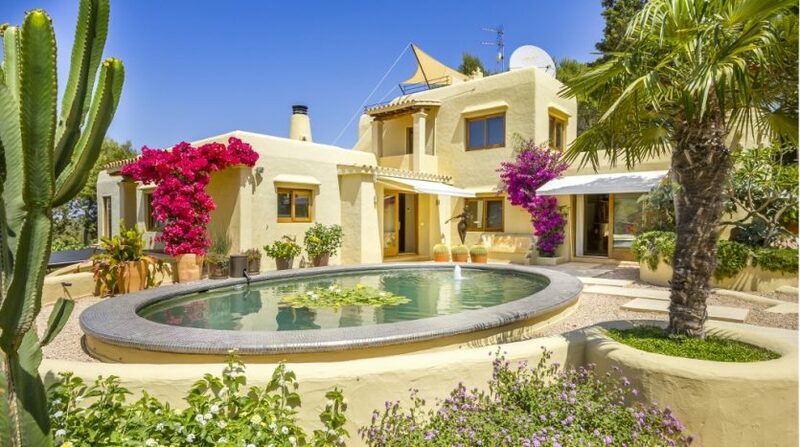 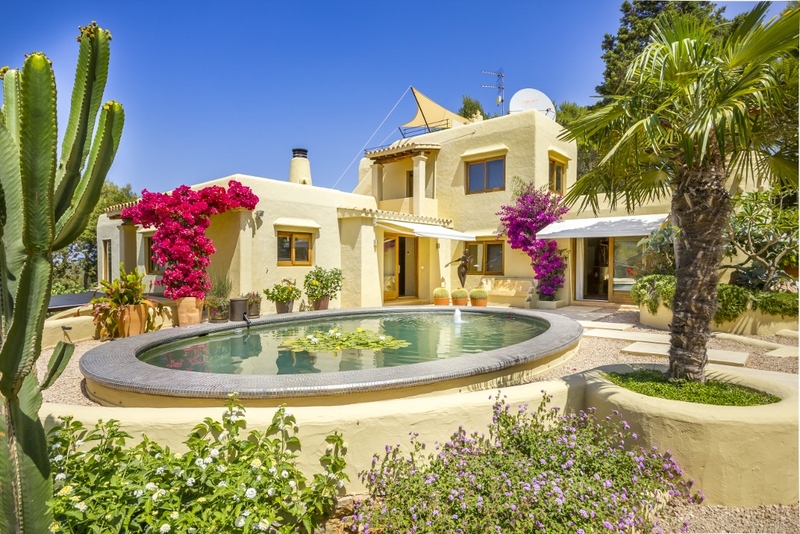 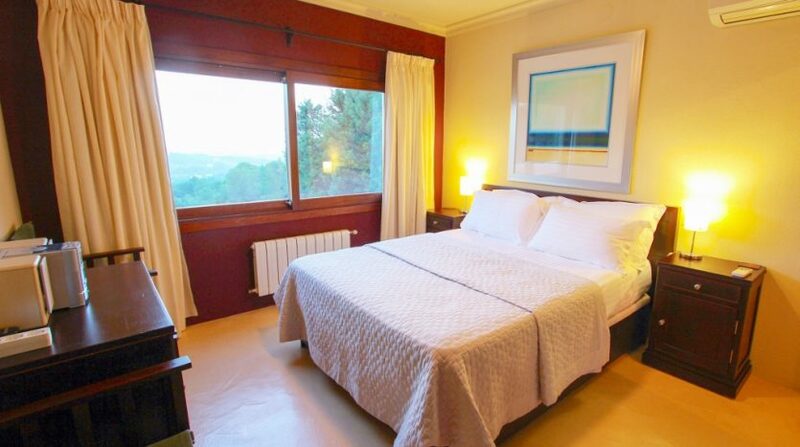 The proximity of St Antonio means that you are easily connected to the Spanish mainland via the regular ferry services and with the International Airport less than 20mins drive, you are in the perfect position to enjoy this property at short notice. 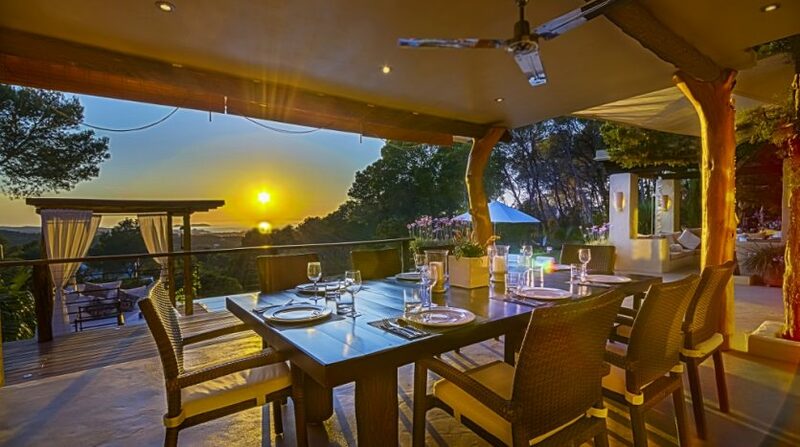 The village of San Rafael is within a short drive and offers an eclectic mix of culinary options from traditional local food to cosmopolitan Mediterranean menus. 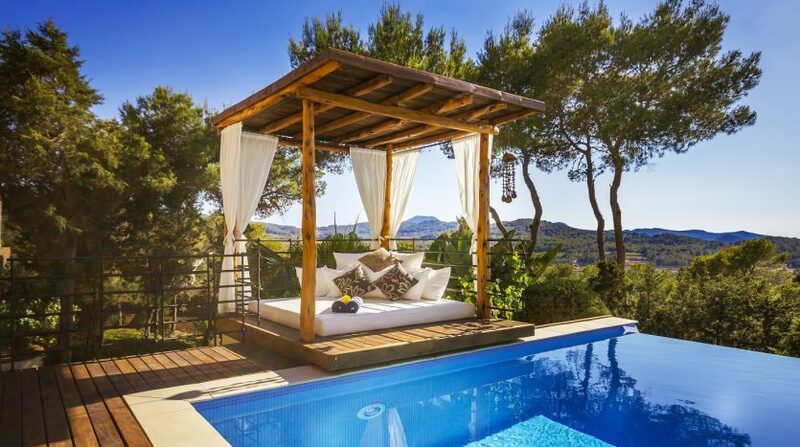 The property really does offer the best of both worlds – a tranquil haven of peace and privacy with all that Ibiza offers within easy reach.